This is a limited time offer from Bank of Montreal, otherwise known as BMO. You can get $100 when you open a new Primary chequing account online after you make a deposit by Feb. 28, 2017 and complete 5 eligible transactions that go through by March 31, 2017. It only takes a few minutes to apply online! This offer ends on February 28, 2017. Click here to check out the details of this offer @ BMO. There are 4 different chequing accounts on the above link that will qualify for the $100 bonus as you can see in the image below. Monthly fees are as shown. You can read the full terms and conditions right here. Some exclusions apply, and are clearly stated in the terms and conditions link. Making a deposit of $50.00 or more into the Chequing Account at a BMO branch, ATM, or by receiving an Interac e-Transfer or a recurring direct deposit. Making an in-store or online purchase using your BMO Debit Card; or - Setting up a recurring Pre-Authorized Debit ("PAD") and have the PAD appear in the account by March 31, 2017. The $100.00 cash bonus will be paid by May 31, 2017 once all requirements are complete. -$40 (minimum) for the monthly fees until,paid out in May. You would still end up with about $50 though. Am I reading that right? You have to pay minimum $10.95 per month service fee, and keep the account open until end of Feb, 2018. So you'll end up paying more in service fees over the year-long contract than the $100 you will get. But, if you need an account, which I do, then it's a pretty good deal. The 100$ will pay for approx 3/4 of the service fees over the 12 months. BUT you still have to complete a few more banking transactions to get the $100. Another option is to take the bare bones account, and pay $4 a month, but you don't get the $100 bonus. I may move to that after the 12 months has finished. Just a few more details on this. You have to make one deposit into the new account, of any amount. On top of that, you have to make five eligible transactions, which among a few other things, includes making a minimum $50 deposit, or paying bills using the account. The initial deposit has to be done by end of Feb, and the other five transactions must be completed by end of March. If you do all that, then you will get the $100 by the end of May. You have to keep the account open until end of Feb 2018, and pay the minimum $10.95 fee on the account until then. So, there is no way to "make money" on this, but it can pay for a good chunk of your service fees for the year. 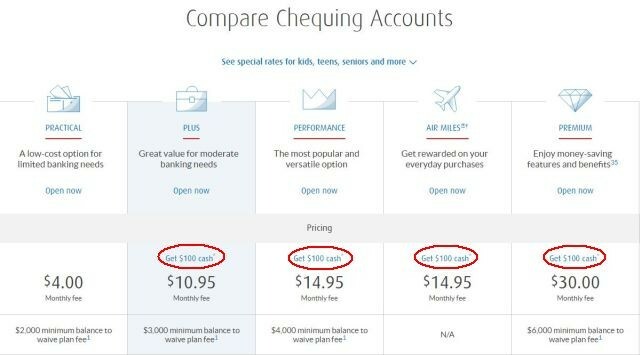 Why would you want an account from BMO or any of the other major banks when their monthly fees are so high? Banks shouldn't be charging any monthly service fee as they already invest people's deposit in stocks, make money on things like foreign transaction fees, service fees, cheques, loans. I'd suggest getting an account with Tangerine. If you use my 'orange key' 45332525S1 when you sign up you get $50 cash when you open your account. No BS monthly fees. And if you didn't know everything is done online with them. You may also want to consider your local credit union, but credit unions tend to have vastly inferior online systems.